Is it the remains of a woolly mammoth — or a decaying whale? 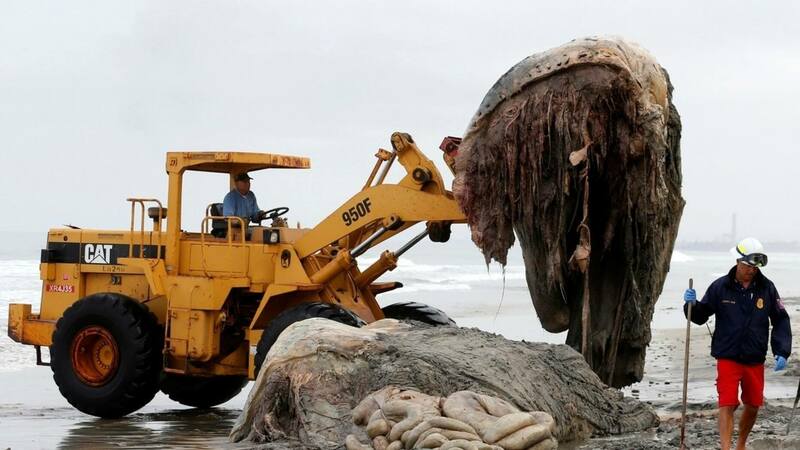 Those were the questions on beachgoers’ minds as they gathered around a giant, hairy sea creature that was beached in Siberia. The mysterious creature, which doesn’t appear to have a prominent face with eyes, recently washed up from the Bering Sea. The creature is about three times as big as an average man and some reported seeing at least one tentacle, prompting some to question whether it was a huge octopus. The carcass had a pungent odor. Marine biologist Sergei Kornev, who works at the Russian Research Institute of Fisheries and Oceanography (VNIRO), told the newspaper the “globster” was most likely a piece of a whale that had been dead for a while. It’s currently unclear whether researchers will take tissue or DNA samples from the creature. This isn’t the first time a shaggy-haired “monster” has been spotted on a beach. A similar creature washed up on a Philippines beach in May, causing chaos in the San Antonio area. A video of the massive greyish white creature was posted to YouTube, showing two men with ropes working together to pull the monster out of the water. Based on the size and shape of the creature, and what marine experts observed, fishery experts confirmed it was the body of a whale. In February 2017, another odd creature washed ashore in the Philippines, just off the Dinagat Islands. Similarly, the animal was 20 feet long, weighed around 4,000 pounds and had “long, shaggy white hair,” according to a National Geographic report at the time.